It’s almost December and at this time of year, the fact that “it’s nearly Christmas!” is generally used as an excuse to gorge on pre-season mince pies and mulled wine. Don’t get me wrong, I like early festive treats as much as the next person, but I do find that all of this early munching kind of ruins the excitement of the gorgathon that occurs on the day itself. I’ve therefore been trying to find a (reasonably) healthy balance – making tasty puddings that aren’t going to give me the pastry sweats or make me totally sick of cinnamon and allspice, but still deliver that satisfying, sugary hit – and these bad boys are just the ticket. 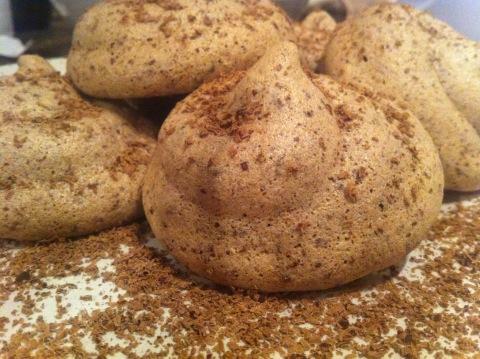 This entry was posted in Recipes and tagged chocolate, cocoa, eggs, meringues, sugar on November 25, 2012 by eleanor.